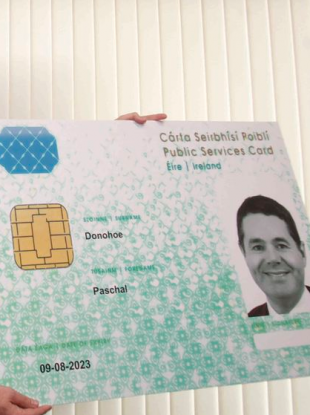 CONCERNS WERE RAISED over the public services card becoming a “de facto” national ID card at the very earliest meetings about its introduction. The issues were flagged in late 2009 at preliminary meetings between officials from the DPC and their counterparts in the Department of Social and Family Affairs, who were responsible at the time. The Commissioner is concerned that the inclusion of the [PPS number] is not justified in a circumstance where it is encoded on the card and would serve to support arguments that the Public Services Card is a de facto national identity card to be demanded indiscriminately. The email also said legislation, as it was then worded, could end up letting public bodies demand the Public Services Card when providing any service. The concerns over having to provide the card to access a wider range of public services proved prescient during a recent storm of publicity about its use. Minutes of the January 2010 meeting also show how the Department at one stage wanted the nationality of a person to appear on the card. Later emails reveal how further consideration was being given to include other personal details on the card in parallel with a separate project for EU driving licences. Documents obtained under an FOI request also show how last year the Data Protection Commissioner believed the Department of Social Protection was not doing a good enough job keeping people informed about the public services card. The office also explained how being open and transparent about how the system works would help maintain “public confidence” in the system. In June, the Department website was updated to provide further detail on the card. Two months later however, the Data Protection Commissioner wrote again to ask that even more detailed information be provided on the public services card listing 47 separate questions about its use. “As we outlined yesterday, it is [our] position that these questions need to be urgently answered and published in the interests of transparency,” an email said. We ask [this] be done as a matter of priority given the urgency with which detailed information to the public on the issues we have identified is required. In a statement, the Department of Employment Affairs and Social Protection said it takes its “data protection obligations very seriously”. It said it consulted on an “ongoing basis” with the Data Protection Commissioner about any new developments in using the card. A spokesman for the Data Protection Commissioner said: “While the card itself has over time evolved into what is now described as a token of a digital identity, the original purpose … was to facilitate physical card-based transactions with public services. The office said it was only since 2015 that it and the public had become aware that the card would become a mandatory requirement for a range of public services. Watch: The Public Services Card – should we care? Email “There were fears the PSC would become a “de facto” national ID card from the very outset”. Feedback on “There were fears the PSC would become a “de facto” national ID card from the very outset”.